Don Milne back to guide us on our 18th day of travel along historic US-6. Yesterday, Roadtrip-'62 ™ traveled 100 miles from Napoleon, Ohio to Nappanee, Indiana. Today, we will skirt the edge of the Chicago metropolitan area, as we go through Gary, Indiana. We will not see many museums today, but we will find a few surprises. If you see anything you like, get yourself out on the road and enjoy it in person. A virtual roadtrip is fun, but there's nothing like the real thing! At any time, click on an underlined word below to learn more about the places on the trip. I think we’re going to put on some real miles today, and make up for some of those 50-mile days from early in the trip. Let’s get back on the road again! I bought a pie and donuts yesterday, so let’s have the donuts for breakfast and save the pie for dessert at lunch. To make a good picnic lunch, I’m stopping first at John’s Butcher Shop. John’s has been in Nappanee since 1941. While we won’t need to use their custom butchering services, this is a good, long-established store to get some picnic supplies. In addition to some milk, chips and veggies, I’m going to try some of their home made ham salad for my sandwiches. With that done, let’s stop at the Nappanee Public Library. Nappanee has the most native cartoonists for a city of its size, and the library has a permanent cartoon exhibit in the Heritage Center. They display works from six local cartoonists who found nationwide fame, including Bill Holman, Fred Neher, and Max Gwin. These three artists were all still creating during 1962. Max drew “Slim and Spud” for the Prairie Farmer magazine from 1955-1991, taking over from other cartoonists. Fred Neher's “Life's Like That” ran from 1934-1977, and the town’s most famous cartoonist, Bill Holman, had his “Smokey Stover” published from 1935-1973. Holman was one of the co-founders of the National Cartoonists Society, and he was the organization's president in 1961-1962. Time to leave Nappanee and continue west. Next town along US-6 is Bremen, Indiana. Today, US-6 has a bypass but in 1962 it went through downtown, and that’s the way we will go. Bremen was home to TV Time Foods, makers of TV Time Popcorn, whose corn storage silos we saw yesterday back in Napoleon, Ohio. Seems like most of these small towns have a food manufacturer, turning local harvests into goodies. Something else these small towns seem to have is industry. Bremen has Bremen Castings, a manufacturer of gray iron and ductile iron machined castings since 1939. Back in 1962 it was still known by its original name of Bremen Gray Iron Foundry. Grey iron castings have many uses, including in autos. Maybe our Chevy Impala used some of their castings. Also in Bremen is Indiana Carton. Since 1933, they have been manufacturing paper folding cartons, including some of my favorite types: donut and pie boxes! At Lapaz, Indiana we cross US-31. As with US-27, this highway began at Mackinaw City, Michigan, along with our previous journey down US-23. It runs from there south to Spanish Fort, Alabama. It’s been shortened a bit at both ends, having formerly reached Mobile, Alabama at the south. We soon cross US-35, running with it for about five miles through the Kingsford Heights / Kingsbury area. Route US-35 runs from Michigan City, Indiana to the Charleston, West Virginia area, and actually travels slightly farther east-west than north-south. That’s an odd pattern for an odd-numbered route and causes it to cross our old US-23 roadtrip at Chillicothe, Ohio. We crossed US-33 yesterday and it seems strange that we would cross US-31, US-33, and US-35 all in a relatively short distance here. But we won’t cross US-37 next…there is no such highway! As we drive US-6 through Indiana, we are reminded that this highway is also known as the Grand Army of The Republic Highway. Indiana has many of these signs, whereas Ohio had few. The name honors the Sons of Union Veterans of the Civil War organization. Another war is memorialized in a different way in the Kingsford Heights / Kingsbury area. Kingsford Heights, Indiana was a company town built by the U.S. Government during World War II to house the workers at the nearby Kingsbury Ordinance Plant. The plant was the second highest ammunitions supplier in the United States during war. The city, known as Victory City during the war, grew to 2,600 dormitories, trailers, and prefabricated homes. When the war ended, the plant was closed down and the city started to empty out. Residents purchased much of the city property from the government in 1951 and part of the city is occupied today. But part of the abandoned street pattern still exists just off US-6. Some of the abandoned plant would have been visible in 1962, and still is. Some of the land has become the Kingsbury Fish and Wildlife Area, established in 1965. The remainder of the plant property has been converted to a number of industrial uses. Looks like we might drive a long distance today, as I’m not finding much to stop for in the farm country. We could stop at the Moraine Nature Preserve, about 6 miles west of Westville, Indiana, for a nice hike. But it’s really too new for us as it was only created in 1971. It was expanded later and now covers about 800 acres of a variety of glacial moraine landforms. In Westville, we crossed another US route, US-421. Like US-35, this highway begins at Michigan City, Indiana. From there it travels south to Fort Fisher, North Carolina. Like so many other US numbered routes we have crossed in northern Indiana, it also crosses our US-23 roadtrip, actually running together with it from Duffield to Gate City, Virginia. If you’re driving through here on your roadtrip in August, you may pass truckloads of freshly harvested tomatoes heading for a processing plant: perhaps the ketchup factory that we saw two days ago back in Fremont, Ohio. About 3 miles west, we come parallel to and just a couple miles from the Indiana Tollway. We stay near this or the I-94 freeway all the way to the Illinois border, as the heavy, fast traffic approaches Chicago. But US-6 continues through a rural area on our old two-lane road for about another 10 miles, so enjoy the solitude for awhile longer. As we approach Hobart, Indiana, we will find ourselves in the urban sprawl of Chicago for the rest of the day. That will slow down our progress, as we head through congested suburbs. Hobart's most important industry in the nineteenth century was brickmaking. The fine glacial clay of the area was perfect for making bricks. W.B. Owen, the first large brickyard, was established in 1863 and was well positioned to help rebuild Chicago after the Great Chicago Fire of October 1871. Owen brickworks converted from bricks to terra cotta building tile used for fireproof building construction. National Fireproofing Company bought the company and operated it here until 1964, so we could have seen the tail end of production. Other brickyards were also opened in the area, including Kulage Brick Works but none remain. If we were staying overnight here, I'd stop at the 49'er Drive-In Theatre, located just 1.5 miles south of US-6. They've been showing great movies since 1956 and have been named one of the Top Ten Drive-Ins by USA TODAY. Just beyond there, and just before we get to Hobart, Indiana, is The Seven Dolors Shrine. Our Lady of Sorrows Church was originally the chapel of the Shrine, forming the north wing of the former Franciscan Friary. 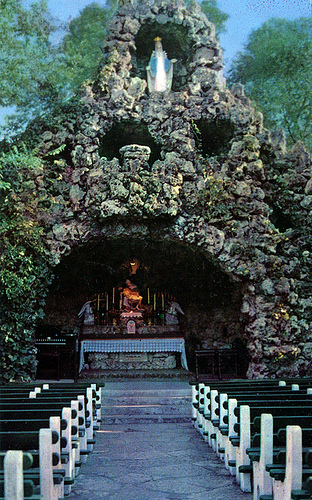 The Friars dedicated the chapel in 1959, as the crowning achievement of the Shrine they had been constructing since 1928. Beginning then, they cleared the wooded land and built grottos, a monastery, gardens, and more. By the 1960s the grounds were at their peak. Unfortunately, with declining monastic membership, the shrine was closed by the Franciscan Friars in 2007 and much of the grounds sold for its real estate value. Our Lady of Sorrows remained a diocesan parish and the pond and waterfall have been restored to nearly their original condition. Visitors and historians are welcome to view the remaining statues which were part of the Seven Dolors Shrine, including the life-size statue of the Sorrowful Mother holding the body of a fallen soldier in her arms. This stone statue was sculpted by Eugene Kormendi of Notre Dame University’s Art Department in 1946, and is dedicated to Catholic men and women who gave their lives for their country during World War II. In case you’re wondering, and I was, Dolor is a Latin word meaning sorrow, so that the name of the Shrine translates literally to "Shrine of the Seven Sorrows." The next town is Portage, Indiana, but we only cut through the edge of town. Because the main portion of the city lies on US-12 and US-20, I’m going to leave sightseeing in both Portage and Gary, Indiana to a future roadtrip on one of those roads. We also pass through the edge of Lake Station, Indiana, which was officially known as East Gary in 1962. The name was originally Lake Station, was changed to East Gary in 1908, and changed back to Lake Station in 1977. US-6 takes a turn here today and joins the I-94 freeway. But in 1962, it continued west on a two-lane road and we’ll drive that, even though it’s unnumbered today. As we enter the southern edge of Gary, Indiana, you might notice that the development is much older than it has been since Hobart. There are older stores, homes, and brick churches and schools that we could have seen in 1962, mostly a bit more rundown over the last 50-some years. Not much business here anymore though. Many of the buildings and lots in this part of Gary are abandoned, and I even saw one intersection where the traffic signals were abandoned on the street corners and stop signs were strapped to them! Through this part of Indiana and Illinois, US-6 follows Ridge Road. The road is located near the top of a 25-foot-high ridge of sand and gravel deposits that formed the shorelines of the Calumet and Glenwood stages of Lake Chicago between various Ice Ages. The ridge was once a prominent Indian trail and that’s probably why US-6 ended up here. North and south of the ridge are clay deposits that became the basis for the brickyards throughout the area in the late 1800s. There are places you can see that the land on the south side of the road is still higher than the road, so we’re not always on the top of the ridge. Some cemeteries are located on that high ground just as we approach Griffith, Indiana. We also end up back in newer development again with a 5-lane highway. This ridge gave the City of Highland, Indiana its name. Here we cross US-41, one of the longest north-south routes, covering 2035 miles from Copper Harbor, Michigan to Miami, Florida. It travels through a wide variety of scenery, including the metropolis of Chicago and the Everglades swamp. Quite a lot of the residential areas we pass through look like 1950s-1960 homes. We’re going to stop at Wicker Memorial Park for that picnic lunch I prepared for. The park was dedicated in 1927 to the "doughboys" of World War I, so like the homes, the park was here in 1962. It has three miles of trails and you can even rent bicycles if you don’t want to walk after lunch. I think I’ll try the bikes, as I didn’t bring mine on this roadtrip. If you’d like to stay longer, the park also contains an 18-hole golf course and driving range. Wicker Memorial Park is right on the corner of old US-6 and US-41. I’ve seen a lot of old postcards that indicate this intersection was the main stop for tourists in the area, during the 1940s and 1950s. There were several restaurants and motels nearby. After lunch, and dessert of that Amish pie we bought last night, it’s on through Munster, Indiana. Nothing really marks the state line between Indiana and Illinois, in either direction. Ridge Road doesn’t even carry a highway number anymore, so no signs change here. There’s even one store named for Munster that is actually in Lansing, Illinois. The only clue I found is a tobacco shop, which might indicate that cigarette taxes are higher in one state than the other. On either side, we would have seen a lot of new buildings here in 1962. The suburban growth of America was in full bloom during the 1950s, with the last remaining farmland being subdivided in 1964. Our old US-6 route finally leaves Ridge Road here and heads north a bit to pick up modern-day US-6, after it leaves the Kingery Expressway. This is the land of shopping centers, probably because of the expressway interchange. As we pass through Calumet City, Illinois, we see the giant River Oaks Shopping Center, which is a bit too new for our time. It was built in 1966, as the suburban sprawl continued south. More suburbs and growth occurred along US-6, as we turn west again through South Holland and Harvey, Illinois. The big industry that drove Harvey’s growth was the former Sinclair Oil research facility. The complex was established in 1948 and by 1960, Harvey's population reached 29,071. Sinclair was formed by Harry F. Sinclair in 1916 and grew to be one of the country’s largest oil companies, ranking 21st on the Fortune 500 list of biggest US companies in 1955. Much of the growth was fueled by Sinclair’s purchase of other petroleum companies out of receivership or bankruptcy during the Great Depression. The company was acquired by the Atlantic Richfield Company (ARCO) in 1969, but the Sinclair name and certain western assets were sold off in 1976. Its dinosaur trademark, which we could have seen advertising Sinclair DINO Gasoline in 1962, is still in use today. Also in Harvey, we cross yet another US highway, US-54. This road currently runs from Griggsville, Illinois to El Paso, Texas, but in 1962 it crossed Illinois to end north of us in downtown Chicago. This is another example of a route shortened to avoid dual numbering with an interstate freeway in the 1970s. Most of it paralleled either I-72 or I-57. It has a route oddity in that it enters and leaves Texas twice, cutting across the panhandle of that state. We won’t be able to stop at Jean’s Bakery in Harvey tomorrow morning for donuts, but we can have a virtual tour now. The bakery opened in 1948 and closed in 2011, and we can see the interior in this video shot in 2003 after the name was changed to Irene's. Still looked a lot like it would have in 1962; even the neon sign was original. So we can’t stop at Jean’s...but we can buy some of the taste of the Chicago area in a bottle. What better way to carry some nostalgia with us than to pick up some old time sodas? Chicago has been home to many soda bottlers over the years, and some are still in business. A few local Chicago flavors we could have bought in 1962 that are still around today are Green River, Filbert's Root Beer, and Canfield's. Green River was first bottled in 1919. It’s a lime based soda with a hint of lemon. Filbert's has been a Chicago Tradition since 1926. They supplied the Berghoff Restaurant with its own draft style root beer for over 50 years. The A.J. Canfield Company was founded in Chicago in 1924. Its largest plant, on the south side of Chicago, closed in December 1995 and it’s now bottled elsewhere. I’ll pick up a selection of these at one of the many convenience stores or supermarkets along US-6. Next we drive through Markham and then Oak Forest, Illinois. Oak Forest’s main reason to exist is the Oak Forest Hospital. The facility was completed in 1910 as the Oak Forest Infirmary, the name it was still known as in 1962. It originally accommodated close to 2,000 persons who were destitute because of poverty, mental illness, alcoholism, and other problems. It continued to grow and by 1932, there were more than 4,000 patients though there were still only about 600 residents outside the hospital. Like the rest of the southern suburbs we have been traveling through, Oak Forest experienced dramatic growth in the 1960s. Oak Forest Hospital continues to function today as an important part of Cook County's health care system. It looks like everything west of the center of Oak Forest is from the 1990s or newer, so it undoubtedly would have been farm fields in 1962. Even the towns are new, like Orland Park, Illinois, which has expanded from a couple miles north of US-6 to reach us since that time. We cross US-45 here, which runs from Ontonagon, Michigan on Lake Superior to Mobile, Alabama on the Gulf of Mexico. The highway forms the longest numbered route in Illinois at over 400 miles, because it runs the full length of the state from north to south. West of US-45, there still are some farm fields, but brand new subdivisions are threatening to fill in everything between here and Joliet, Illinois. As we approach Joliet, we pass the Hill-Top Drive-In. Though we could have seen a movie in 1962, there is no movie for us tonight here. The Hill-Top sits abandoned since it closed in 2001. The main concrete screen building still looks good and is used as a billboard, but everything around it has been vandalized. We’re going to end our day in Joliet. The city is named for Louis Joliet, who, along with Father Jacques Marquette, were the first known Europeans to see the area. In 1673, they camped on a huge mound a few miles south of the city location. Joliet Public Library has a bronze statue of Joliet in front. Joliet has long been an industrial city, first with limestone quarrying, then with steel mills, and later with industries that used steel. These included wire mills, stove companies, horseshoe factories, foundries, boiler and tank companies, machine manufacturers, can companies, bridge builders, plating factories, steel car shops. Other industries over the years have ranged from Hart, Schaffner & Marx clothing manufacturing, building of pianos and windmills, to making of wallpaper, barrels, oil and chemical products, and Caterpillar heavy equipment. These waned over the years and Joliet's economy entered a period of decline in the late 1970s. By 1983 its unemployment rate stood at 26 percent! Casinos, a NASCAR racing track, and the continued spread of Chicago’s suburbs from the 1990s to the present have helped the situation improve. The newfound affluence from visitors flocking to the Chicagoland Speedway, Route 66 Raceway, Hollywood Casino, and Harrah’s Casino has led to new expenditures on museums. In 1962, this was not a tourist-oriented city but today there are several museums. The Joliet Area Historical Museum opened in 2002, the Slovenian Woman's Heritage was dedicated in 1983, and the Magosky Museum of Victorian Life & Joliet History is also open. One interesting Joliet landmark has been around since at least the early 1960s: the Milk Bottle in front of what used to be the Weber Dairy plant. Weber Dairy was sold to Prairie Farms Dairy in the 1970s and they closed the facility. The building is now known as the Dairy Center and is used as office space for various businesses. Joliet’s other major industry is prison operation. Joliet Correctional Center and Stateville Correctional Center were both located here. The Joliet Correctional Center opened in 1858 and closed in 2002. Stateville Correctional Center opened in 1925 and is still in operation. A women’s prison was also located across from them for nearly 40 years beginning in 1896. Since 2009, Old Joliet Prison Park has been open in part of the parking lot of the former prison. It features signage about the prison, including information about movies and television shows that have used the prison. The Rialto Square Theatre is another of the 1920s “movie palace” style of theaters that we have seen restored all along US-6. It was designed by Rapp & Rapp Architects of Chicago, who designed many ornate theatres throughout the Midwest, and opened in 1926. The detailed interior plaster sculpture is the work of Eugene Romeo, a Sicilian immigrant who also worked on the Chicago Board of Trade, Chicago Daily News Building, Soldier Field, Merchandise Mart, and Wrigley Building, among others. The interior is modeled after elegant European architecture, including a lobby designed after the Hall of Mirrors in the Palace of Versailles, Paris, France. Like so many other such theatres, it had suffered from age. The Rialto Square was fully restored beginning in 1980 and now offers all types of performing arts. Joliet is also the home of the very first Dairy Queen store! It opened in 1940 in a downtown storefront that is now commemorated with a plaque on the building. The concept of the softserve ice cream was developed in 1938 by John Fremont McCullough and his son in Kankakee, Illinois. The product was sold for a couple of years before the Dairy Queen name was created. This was one of the early franchised restaurants and by 1955 there were over 2,600 stores. The Dairy Queen Brazier menu items were introduced in 1958 and in 1962 the company was reorganized as International Dairy Queen, Inc. Today, there are three Dairy Queens in the Joliet area, so guess where I’m having dinner? Lodging is not such an easy choice tonight. Because of Joliet’s years of decline, the older motels are either gone or not looking so good any more. Even the last time I stayed in Joliet over 10 years ago, I stayed at a brand new MicroTel, now renamed Budget Inn Express. I’ll check out a few tonight though, before I decide if I have to stay at a newer chain motel again. A few possibilities are the Star Inn, which might be an old Holiday Inn. One was located here on West Jefferson Street, from information I found in a 1966 Chamber of Commerce booklet. It also mentioned a Howard Johnson's Motor Lodge on the same street, and I have found that, due to the distinctive front check-in building. Others to check might be the Bel-Air Motel and the Town House Motel, near Joliet Junior College, which is the nation's oldest public community college. The college dates from 1901 and began as an experimental postgraduate high school program. After I find a motel, I’m going to come back out at dusk, find a nice park, and watch the fireflies for awhile. In mid-summer, they spend a couple of hours blinking all over town: in meadows where I have come to expect them, and even downtown! See you tomorrow when Roadtrip-’62 ™ meets the famous Route 66.